Ka kite ano - We will see you again! We want to let you all know that we are currently exploring other ways of sharing our stories, with you our wider community. 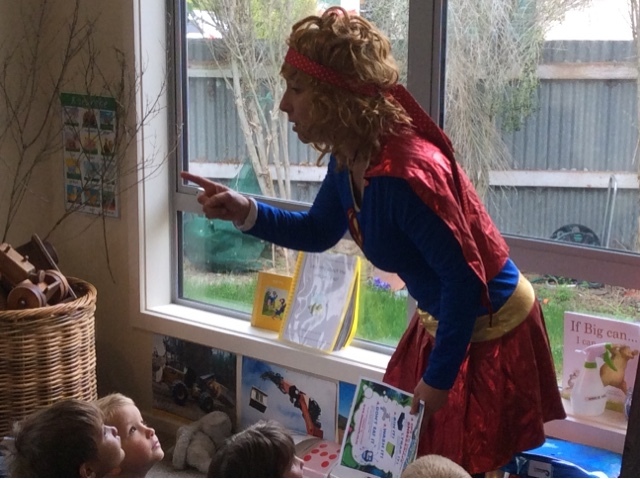 This means that we will not be posting on our BLOG page about the teaching and leanring that happens here at Geraldine Kindergarten. We would love to have your feedback about our BLOG to use and we consolodate our options for sharing our unique kindergarten with you in the future! 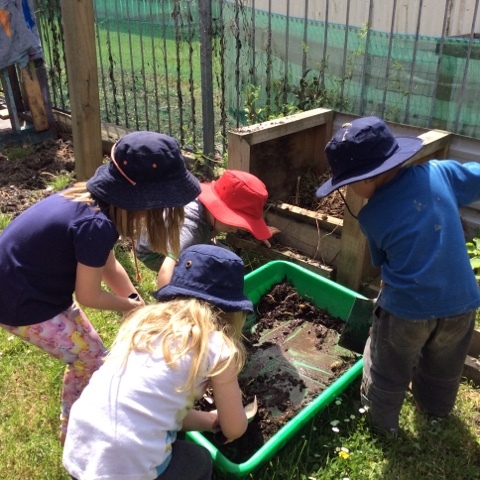 After some interest in bugs, we decided to bring some of the compost out of our compost heap inside for the children to explore a little further. 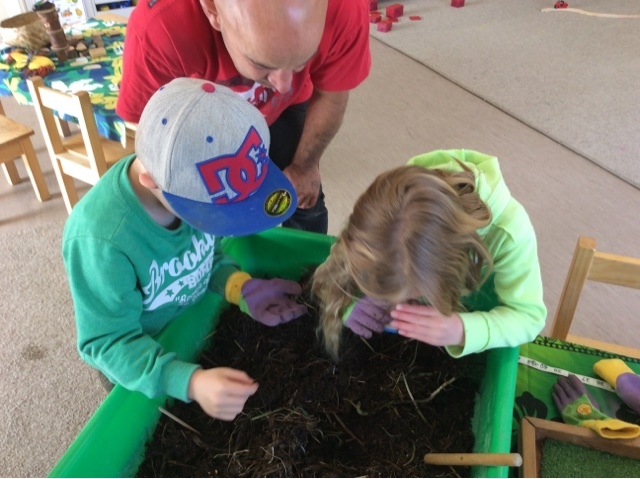 After taking precautions by putting gloves on curiosity set in and the children explored the compost excitedly finding worm and other bugs. Once they had finished with the compost inside we decided to put it back in our compost heap. 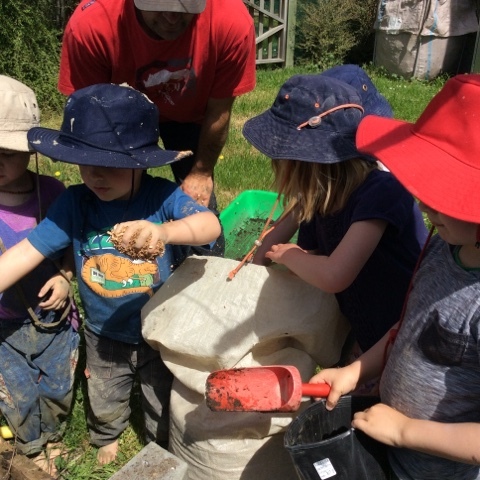 As an extension to the children's learning we talked about adding more things to the compost heap to help the process so soon our compost would be ready for our gardens. 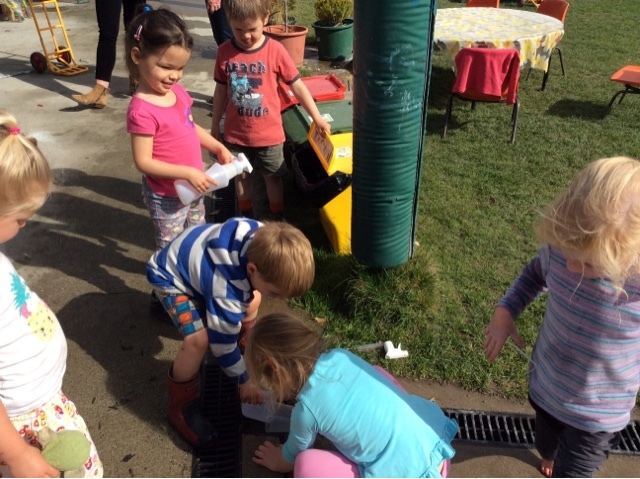 The children took responsibility for adding the contents of our green bin as well as some saw dust to the top of the heap, managing their impulsivity as their friends had a turn, taking care so that the saw dust didn't blow into other people's faces. We will return to our compost in the next few days to turn it over and start a new heap ready to work its magic. Its a rocket ship, no its a fire engine! 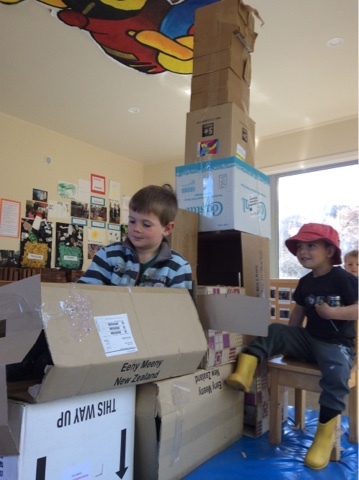 This morning a group of children enjoyed using a large collection of cardboard boxes to create a rocket ship! Thick sellotape was used to hold the boxes toegther and then it was used in role play. It soon turned into a fire engine where it was sat in and fires were found and put out - a great extension on our visit to the fire station at the end of last term. 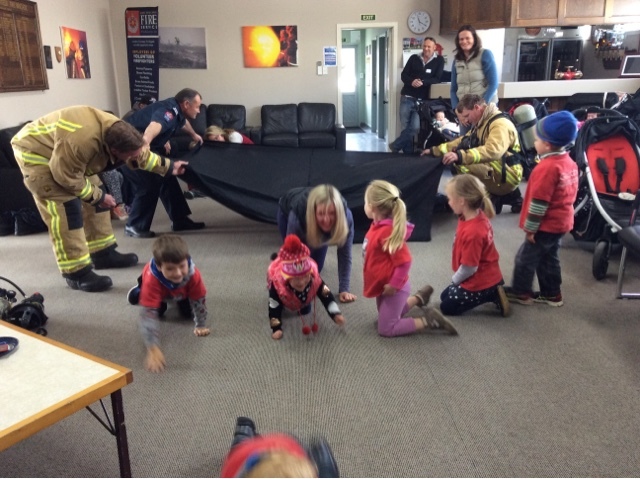 This morning we made our way to our local fire station. 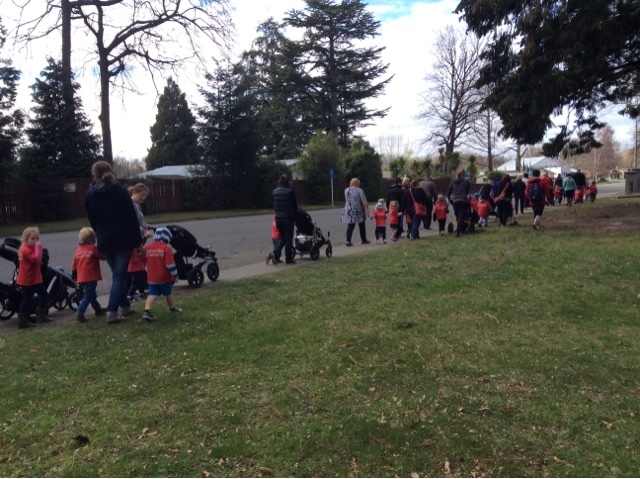 A lovely walk along the park and down the street to the fire station where the volunteer fire fighters were awaiting out arrival! 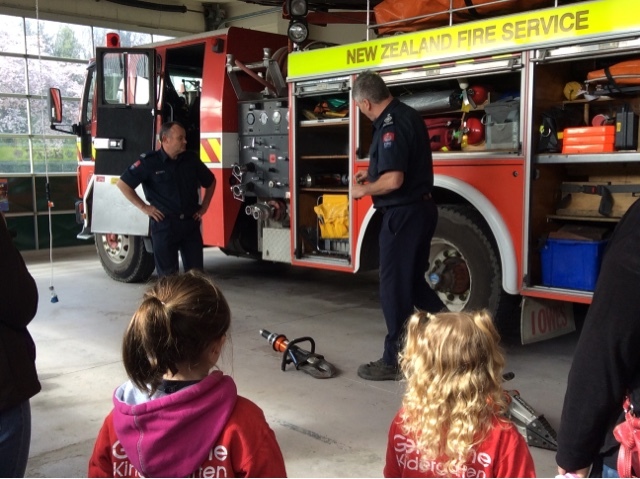 A very well organised visit by the fire station meant that children were engaging with and learning about a range of fire related equipment and safety messages. Children made their way outside to where a fire engine was open for all to get into a have a look around, even turning on the siren was an exciting time for many! 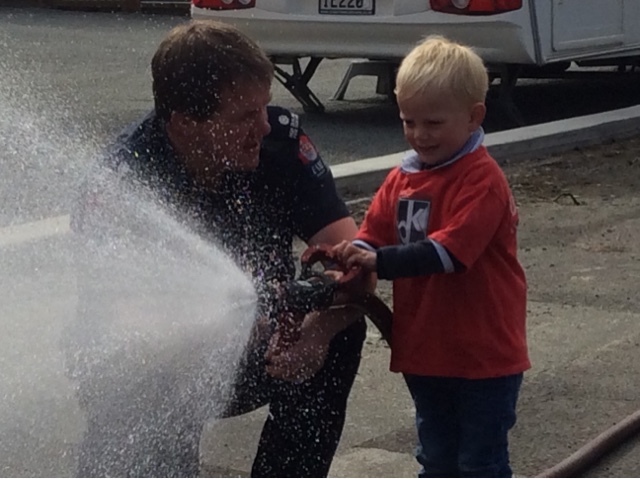 A hose was connected to the fire truck that everyone got to have a turn holding onto and squirt water toward a target, while finding out about the different controls on the hose and giving them a try. 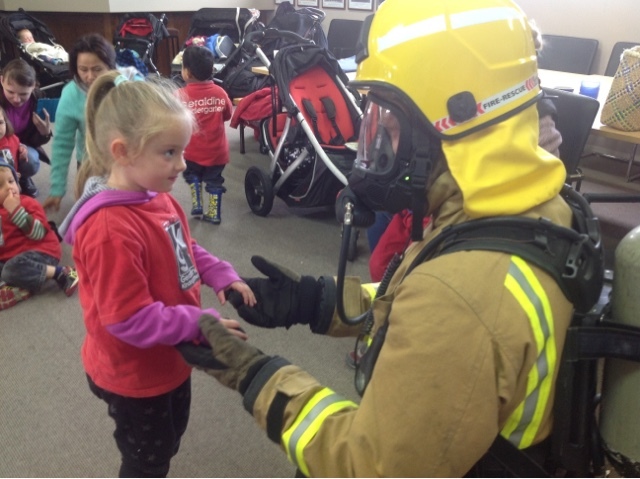 We had the opportunity to explore the different pieces of equipment that are on the fire truck, from safety equipment to life saving machinery! Some favourites amongst the children were the vehicle cutters, stretchers and inflatable air bags. 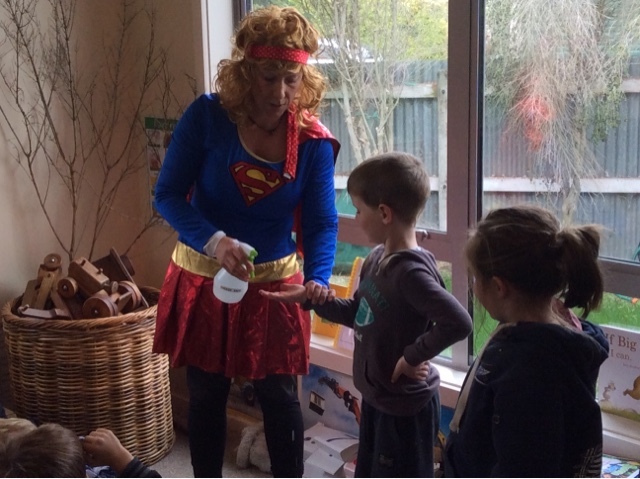 We also listened to a fire fighter share with us about the dangers of matches, lighters and candles in our homes and how important it is for us to have smoke alarms - even though they do beep when we burn the toast! Some fire fighters dressed up in their safety gear so that we could see how they looked and also sounded when they breathed with their masks on. 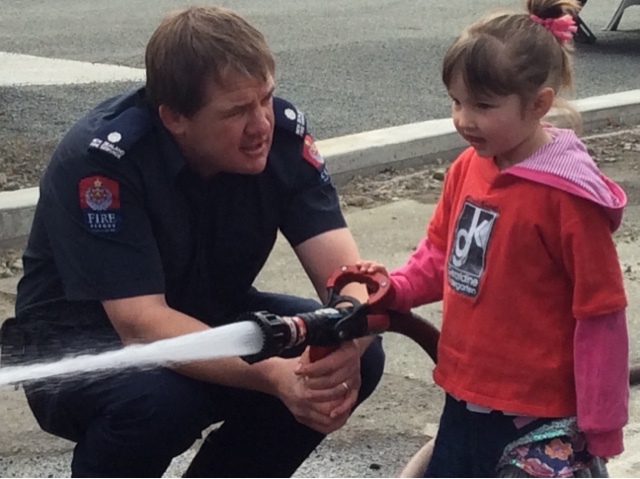 Thanks for the amazing morning Geraldine Fire Station - conversations will continue to be had about our visit and we will practise some important messages you shared with us! 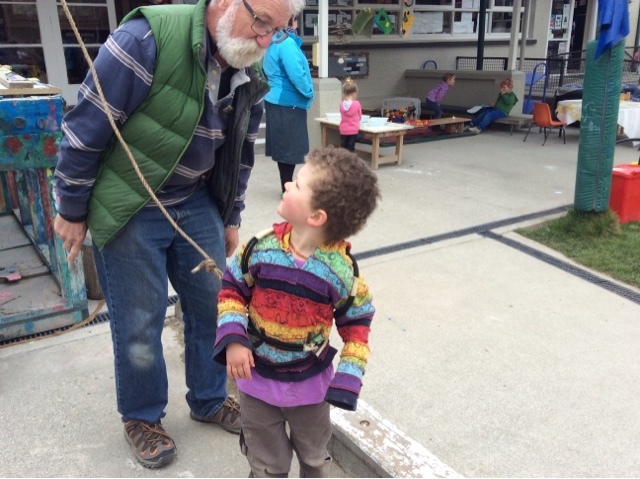 We love having visitors at Kindergarten and Peter Fleming arrived down from Christchurch, who has taught in the Kindergartens of Christchurch over many years, to share some wonderful rope activities with the children. Long ropes, short ropes, and additional equipment like the pulleys were constructed around the Kindergarten with the children's help. 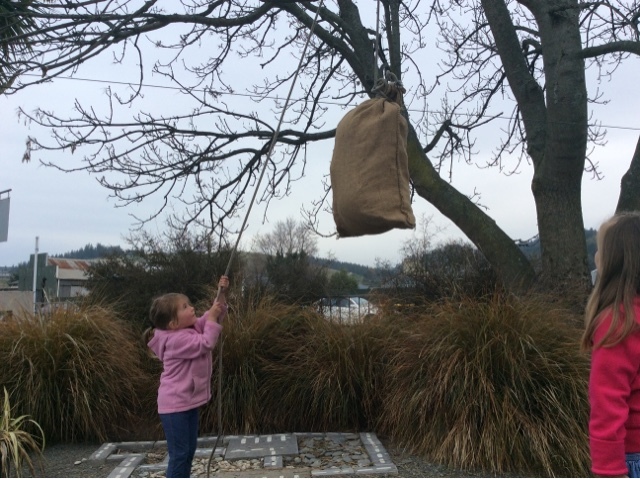 They pulled, climbed, and ran along with a pulley rope to swing off the ground with a harness attached, well nearly! 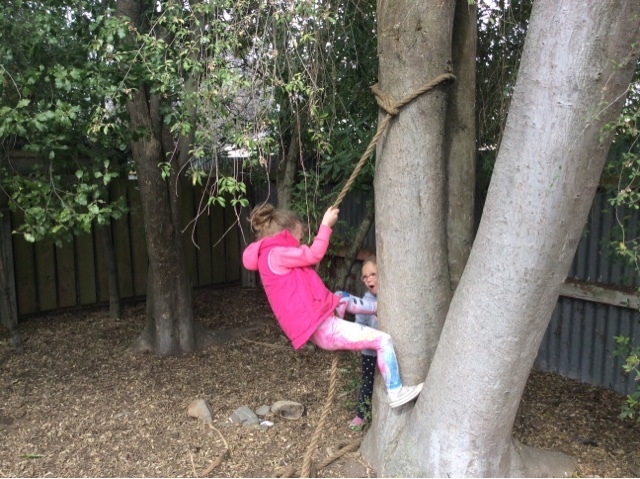 The ropes gave many opportunities to give things a go and gave us lots of rope activities that we can do together at Geraldine Kindergarten. 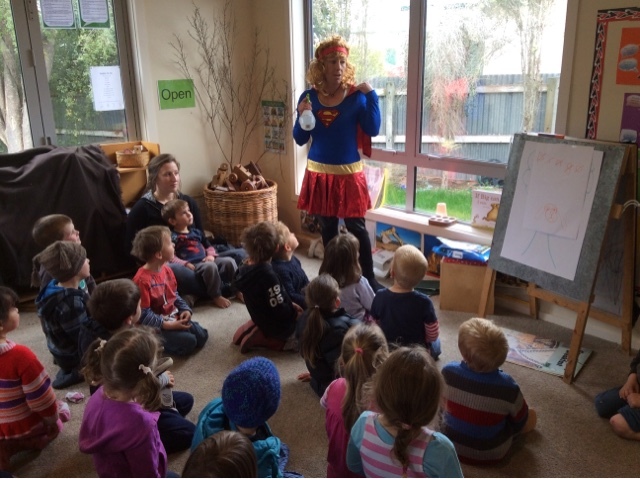 Kia ora Peter, we so enjoyed your visit to our special Kindergarten. With lots of bugs about Sneeze Girl's visit was very timely. Sneeze Girl showed us what happens when we sneeze or cough and how the bugs are spread around in the air. She first showed us using a spray bottle of water squirting it all over us making us want to duck for cover. 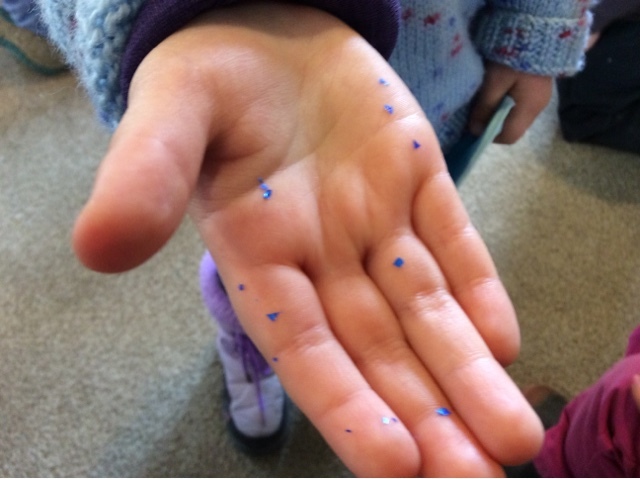 Next Sneeze Girl put some glitter on some children's hands to represent the bugs and then asked us to shake hands with a friend.Very quickly we saw the germs transfer to someone else and then another person and another!!! Puta atu! Get out of my way. Ka kite ano Sneeze Girl. We will practice and remember! 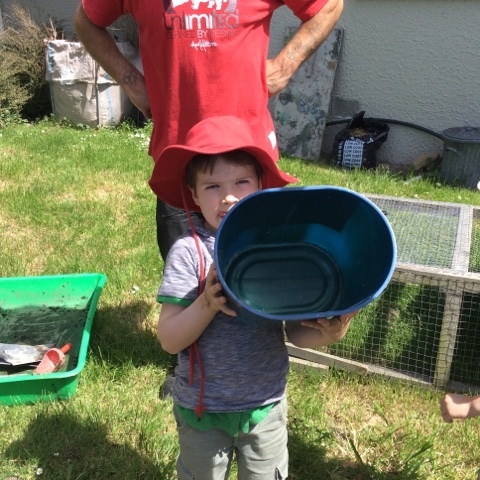 Today the tamariki were very curious about the drains. They noticed there were some small objects such as lids and Lego siting at the bottom. This was a chance to try some problem solving. We discovered that the end of the drain popped out and this was a good place to pour and scoop water. 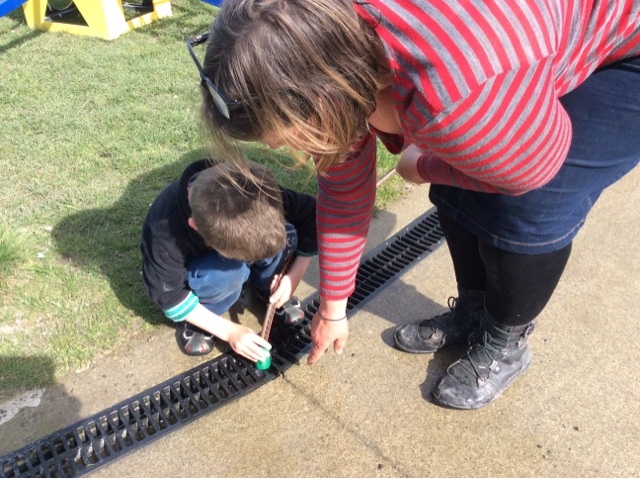 Then the hose came out and we explored how the force of the water could move objects along the drain. 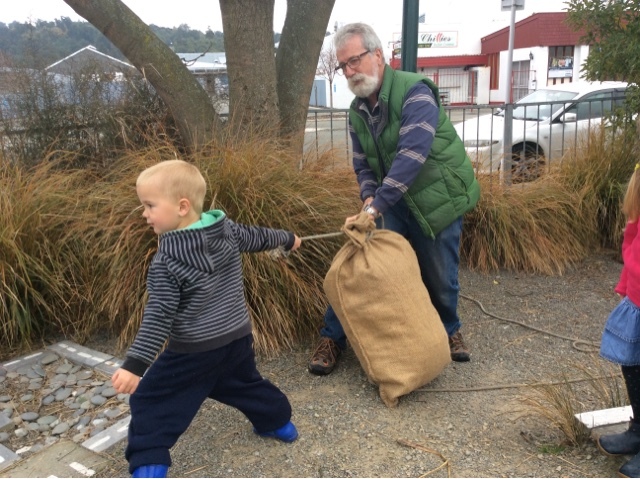 He pai koe ki te whakaaro pēna. That’s good thinking. Lots of perseverance was required to move things along under the grating. 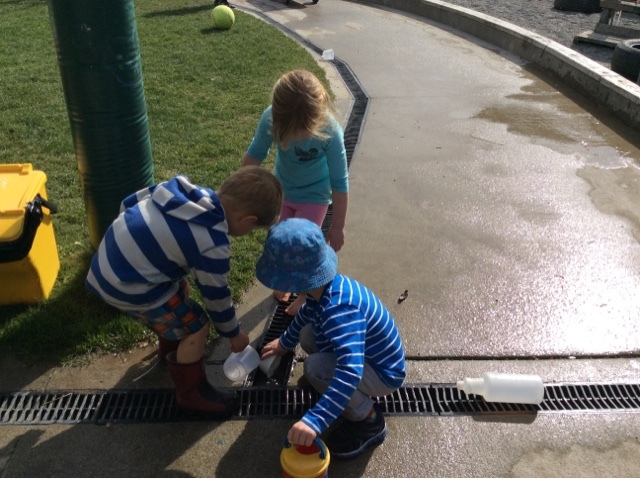 Tamariki practiced turn taking and managing their impulsivity as there was only enough room for one scoop at a time in the open part of the drain. 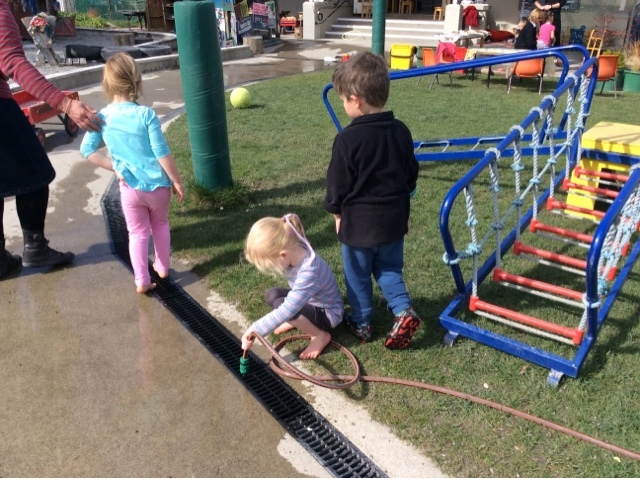 With the weather becoming warmer, more water play like this will encourage the tamariki to explore more water based problem solving activities.